Maybe I'm a tad sensitive, at least for someone who once scrapped with another dockworker while mutually armed with shovels, but I doubt it. Maybe it's because my Dad flew tons of tuna for Nippon Cargo Airlines back in the day, but I doubt it. Or maybe it's because I just read CitiGroup's 2006 report praising plutonomy, so I'm looking a little too hard, but I doubt it. Or maybe it's because my first girlfriend was first generation Japanese American; her mother grew up in Japan during the war. I learned a little about Japan, and a lot about cultural blindness. 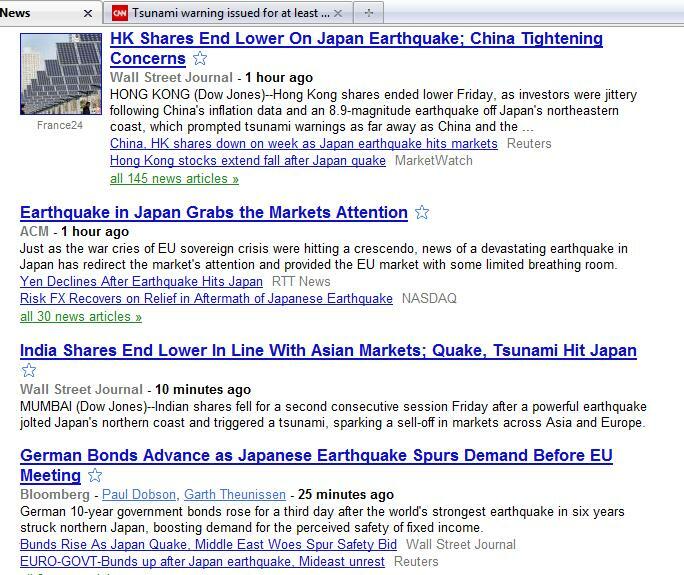 Maybe we'd see the same concern about the financial markets if this had happened in Ireland. What better way to nakedly expose what matters most to those of us who have the most. This is shameful. 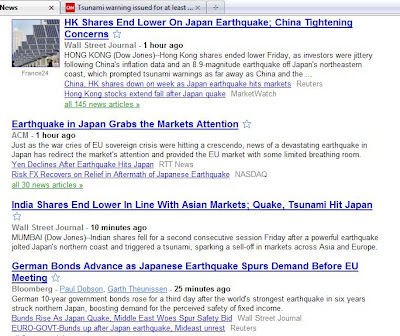 Photo is of Google news, obviously, taken around 6:30 AM EST. Yes, I know the news order is based on a computer algorithm--this makes it better? Yes, I know it would be shameful no matter what part of the world got hit. I so agree. but I think people who have a lot of money continue to believe that this makes them better than mere peons, so if peons are dying, it's not a problem. Gosh, let's do, "oh the humanity" for a day before we start the financial punishment. I've had the fortune of knowing a few people with a lot of money, a lot of money. If you ever get to eat with one, make sure you try the wine. And here's the thing--they don't believe they're better. Most don't really think about it at all. And that's what's killing us.